If your friend or family member has been arrested in Richardson we’re here to help you with Richardson, TX Bail Bonds. At Southern Bail Bonds we have 30 years of experience in the bail industry and understand the Dallas County jail system and are experts in dealing with all types of Bail Bonds. When someone is arrested they will be transported to the Richardson detention center for booking. At the detention center they will be fingerprinted, searched, photographed and finally, booked in. The individual will be placed in a jail cell and remain there until Richardson Bail Bonds are posted or until they are released by a judge. They will go before a judge (arraignment) to hear the charges and have the terms of their bail set. The arraignment typically takes place within 8 – 10 hours of the arrest, depending on the time of day. Offenses can be either felony, misdemeanor or traffic (DUI/DWI) related. Following the book-in and processing, the individual may be released on Richardson Bail Bonds, if bonds are set by the judge. Richardson, TX bail bonds can be posted 24 hours a day. However it is possible that some defendants may not be granted bail, in which case bail bonds will not result in an individual being released from detention. 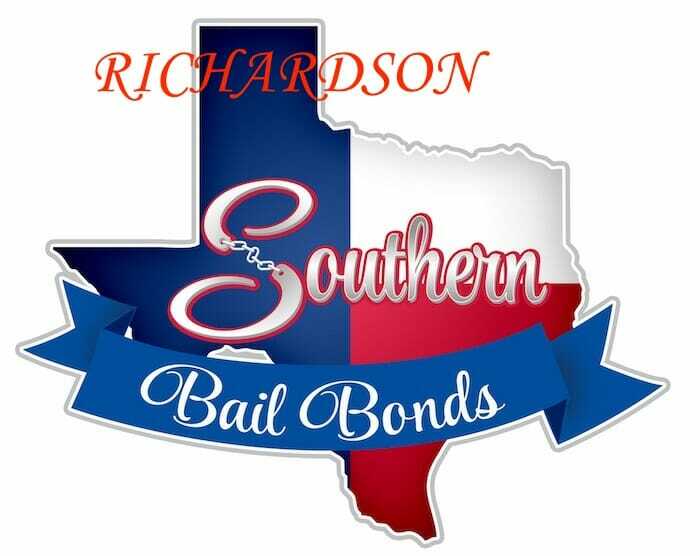 At Southern Bail Bonds, we can arrange for fast, professional and confidential Richardson bail bonds processing to ensure your loved one or friend is released as quickly as possible. We have the expertise to handle any felony, misdemeanor or traffic related bail bonds with quick approvals and no hidden fees. We specialize in No Credit Check bail bonds and Easy Payment Terms. You might! If you’ve been arrested, or have been asked to participate in police interviews or if law enforcement officials want to talk to you about a serious offense, then you may want to get legal advice (disclaimer: Southern Bail Bonds does not offer legal advice). If you do seek legal advice, you will need to determine if the cost of an attorney is something you can afford or if you will need to get a court appointed attorney. If you decide on a court appointed attorney, there are certain economic qualifications you will need to meet. Those will be discussed with you during the book-in process. Whether your attorney is court appointed or a private attorney – listen to what they tell you!! Countless defendants make the mistake of listening to their well-meaning friends (or family), who have NO legal training, and they end up getting awful advice. Or even worse, the defendant takes action on that awful advice and ends up in more trouble. We often advice our clients to only discuss their case with their attorney – because well-meaning friends can get you locked up! It is important that you fully understand how the Richardson, TX bail bonds process works. That’s where we come in – we are happy to answer any questions you may have and provide information on what you can expect throughout the entire Richardson bail bonds process.